Avril Lavigne Being a Mentor in Majors & Minors Reality Show - Not only can sing and create songs, Avril Lavigne will soon be showing off other talents that may not yet widely known. 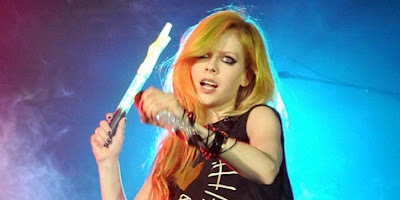 In a reality show that will soon aired in the United States, Avril Lavigne will be the mentor and provide guidance to the newcomers so that they can compete to get a contract from the label. Avril did know exactly what to do to get through the competition to obtain contracts from the music labels. Now he would pass on what he has acquired along the way to the contestants in the event Majors & Minors. Not just get a new star candidate, the event also offers the opportunity for American concert tour winner. Not only the name of Avril Lavigne are going to be a judge once called a mentor in the event that is initiated by Evan Bogart. Avril, according to Contact Music, will be accompanied by Sean Kingston, Leona Lewis, Brandy, Colbie Caillat, Mike Posner (vocalist Cooler Than Me), and Adam Lambert. If all goes well, this show will begin airing later on 23 September.